7.19 points at 27 votes (rank 303). Jack the Nipper 2 is a jump'n'run game. 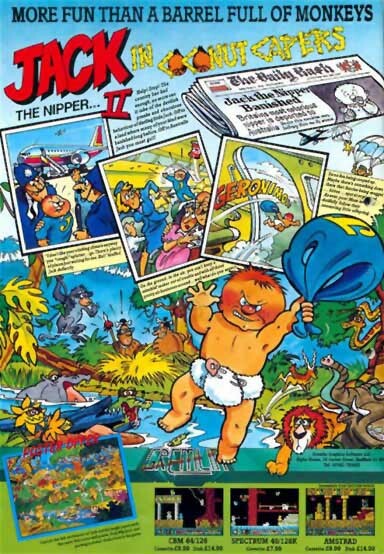 The main actor in this game is Jack the Nipper, a small naughty baby with nappies and cool sunglasses. He is in the jungle where several adventures await him. Imagine the scene – blazing hot sun beats down over a tropical forest, the only sounds to be heard are those of chattering monkeys, a trumpeting elephant and the screeching of the parakeets. Gazelles grace peacefully and zebras are sipping gently from a tropical pool when the peace is disturbed by the drone of an aeroplane. Suddenly, a triumphant, blood curdling yell, swiftly followed by the sound of a thud, shatters the stillness – Jack has landed! 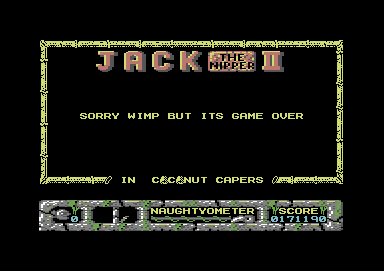 So begins the story of Jack’s exploits in the jungle, after having been so dastardly in his last adventure. You are in a wild jungle where different adventures wait for you. You meet natives, hunters and wild animals. You cross different landscapes as the stone cave, the swamp, the tropical jungle with its huge trees, different temple complexes, the crocodile lake and the hidden mine. In the jungle you find different items. To get king of the jungle you need to solve different tasks (do small tricks). See NAUGHTYOMETER for more. The game is shown in 2D view, one can move freely in the jungle. Sound and music fit the game well and create a good mood. The graphics are diversified and show different landscapes. The C64 version partially differs from other versions (Schneider, Spectrum) of the game. In the C64 version you always start at the same place, whereas in the other versions there are random starting points. In the game there are different items that either serve as *weapons* or can be used to do the *tricks*. The *weapons* are triggered with the fire button, the collected items for *tricks* are used by throwing them out of the ducking position. However, the latter need to be used with the correct characters to have an effect. Altogether can two items be carried at the same time, the weapons can always be used, after a certain number of shots they are used up. In the NAUGHTYOMETER the successfully done tasks are shown. Furthermore, Jack can also use his nappy as a parachute. If he jumps downwards, push the joystick upwards and press the fire button. This is a very important function in the game, as you have to climb on trees often and need to command this "parachute trick" with the nappy to not lose too many lives and get from trees quickly. It needs a bit of practice to do so, not every jump succeeds straightaway and you land with your nose on the jungle ground. Correct timing when jumping is required. First jump, then wait approx. 1-2 seconds and then use the nappy (joystick up and use fire button). Like this, Jack lands safely on the ground. Jack is in the jungle and needs to solve altogether 10 different tasks. You need to use the right items with the right people to solve the tasks. At the beginning of the game you climb down into the stone cave and get the GREASE near the rock. Now you climb up and visit "Tarzan". He is above one of the first temples on the liana, as it is proper for a Tarzan. In the middle of the game (to the right of the Tarzan liana) is the main rope bridge, that is guarded by a native. Cross it and pick up the blowtube in front of the hut. Now swing with the liana over the crocodile pond. WAIT... until the rope swings into your direction again. Now shoot at the native, which stands next to the pond. Now jump back at the rope and the native will now drop into the crocodile pond. Now you can jump back to the other side. In front of the abyss there is now a rope. Pick it up and go to the stone hill, which is under the main rope bridge. Climb on the tree stump on the hill. On the upper right side of the game above the "Temple of Gods" you find the pineapple. Go back to the stone cave and get the dynamite. You find a mouse in the swamp area of the jungle. Get it and go to the elephant which is standing next to the temple. Go to the temple complex (where you have scared the elephant). Go back into the tree tops and go to the rope bridge (do not kill the native!). Stand in front of the rope bridge and throw the termites on it. Go to the entrance of the mine and jump into it. Get the coconut and the toffee and use the mine rail. After surviving the mine rail, you need to face the crocodiles. Give the crocodiles the toffee. Climb through the temple complex into the trees of the jungle and keep to the left. Now go to the onion and then to the bear. You find the honey in the trees (upper left), as it is proper for a jungle. When you have it, go to the bee hive. First climb onto a branch to the left of the bee hive and shoot with the "blowtube" at the hive. Now a few bees will get rebellious. "Just relax"
Now comes the second part! To the left of the bee hive is a small hut. The bees will now follow you. Put down the honey in the hut. Now you have solved all "puzzles". You should have your Naughtyometer complete. You can go to the "Temple of Gods". Pass the temple guard and thus go into the Hall of Thriumph. Now they will announce you King of the Jungle :-) - and you have finished the game. 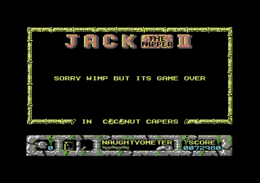 zk: "Very nice and interesting C64 game with diversified jungle landscapes, good music and tricky tasks and if you do not move the joystick for a while, there are a few nicely animated gestures from Jack the Nipper." H.T.W: "A worthy follower of the first part, partially with funny sprites, a huge, smoothly scrolling game area, well fitting background sounds and 10 tricky puzzles (one has to find out the solution to begin with). For me, however, the game is partially too difficult, as you not only have to jump pixel exact, but also the enemies are not half as bad. Without a map you stray around rather without plan at the beginning (you find a map on C64-Games.de) and also with the map it is not easy to find a certain place. It is also a pity that there is no highscore list. But nevertheless an interesting game.". Patrick: A very long game, huge game world. Not as cute as the forerunner, but also not as many enemies. It is only a pity that the number of tricks is so limited. But it was funny and challenging. Occupied me for a long time. Erwin33: Nice game! Diversified graphics and interesting puzzles. A small secret tip for friends of the C64. This page was last modified on 10 July 2015, at 19:10.